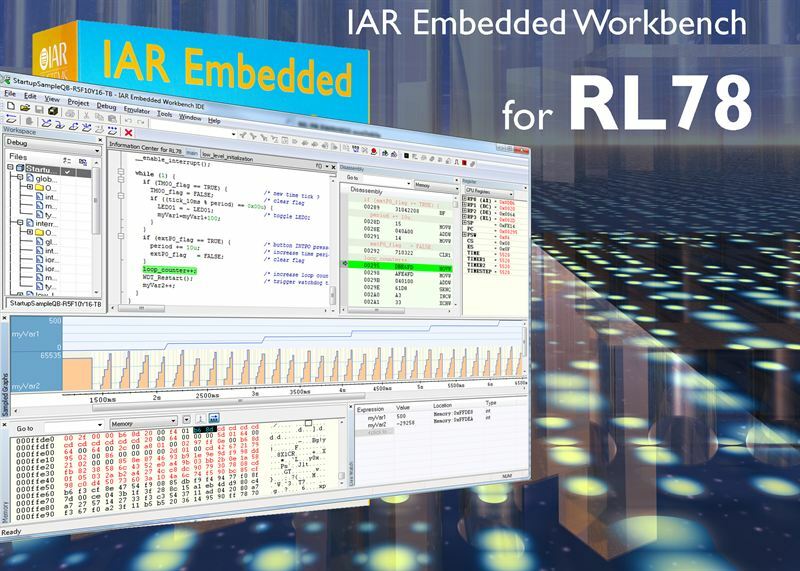 Uppsala, Sweden—March 19, 2013—Today, IAR Systems® releases a new version of its development tool suite IAR Embedded Workbench for Renesas RL78. The new version 1.30 adds a large amount of new functionality for code writing and debugging. For simplified code writing, the new version uses IAR Systems’ new text editor and source browser, which includes user-friendly features such as auto-completion, parameter hints, code folding, block select and indent, bracket matching, zooming and word/paragraph navigation. Also added is project connections functionality for automated integration with device configuration tools. This makes it possible to import files or file packages generated by such external code generation tools and enables IAR Embedded Workbench to automatically detect changes in the generated file set. New in the comprehensive C-SPY® Debugger is the possibility to connect an E1 or E20 emulator to a running system to inspect it without interrupting program execution. Also introduced are Sampled Graphs and several new windows. The Sampled Graphs allow you to specify variables for which you want to collect data samples. You can view the sampled data either in table format in the Data Sample window or as graphs in the Sampled Graphs window. A new Custom SFR window lets you define custom special function registers (SFRs) in C-SPY with selectable access size and type, while the Call Graph window displays all calls made to and from each function from any source file in the active project. The new Macro Quicklaunch window makes it possible to evaluate expressions and to launch C-SPY macros. Thanks to the longstanding close relationship between IAR Systems and Renesas Electronics, IAR Embedded Workbench was the first set of tools available for developing the low-power RL78-based microcontrollers. Since the first release in March of 2011, IAR Systems has made several updates and improvements to the tools, including extraordinary optimizations for code size and speed. The new version brings even further improved optimizations that make code generated for floating-point operations even faster. IAR Systems is committed to continue to provide the world’s widest support for Renesas microcontrollers. The new version adds support for the latest RL78 devices together with various new example projects. Try the tools by downloading a free evaluation license from www.iar.com/ewrl78.